The 2016 Scholarly Communication Institute is over, though the projects and relationships nurtured here are just beginning. Planning will soon begin for SCI 2017. One of the things we’ll need to decide is what the overall theme/topic will be for next year (see this year’s for an example). We’d like to hear your suggestions for this! Please send them to scholcomm-institute@duke.edu or leave a comment below. We expect to announce a new RFP in January. Check back on trianglesci.org or @TriangleSCI for the announcement then. This is the fourth in a series of posts about each of the teams that will be attending SCI 2016, and their projects. This one was submitted by Ada Emmett. The current system of scholarly communication is rife with inequities, imbalances, and barriers, which exclude or impede many scholars and readers in their pursuit of and contributions to knowledge. Although this system has been the subject of much recent discussion and innovation, many current “open access” (OA) solutions perpetuate the inequities or result in new barriers. Assessing these issues from a global viewpoint reveals the inequities. For example, “Gold” OA plans that require article processing charges (APC) (ca. 50% of OA articles) merely shift the access barrier from reader to author. Consequently, although everyone is free to read papers, many authors are excluded. This particular vision of an OA future undermines equitable global participation in scholarly communication. Assumptions: Any ambitious proposal attempting to shape the future of (open-access) publishing must (a) proceed from principles of equitability with regard to cultural, economic, and functional spheres, and (b) emerge from consultations with a diverse and inclusive group of experts varying by region, gender, ethnicity, culture, economic privilege, and disciplinary background. Our team will use the time at the Institute to formalize guiding principles for an open, global, inclusive, equitable publishing system that is free for authors and readers alike (“platinum” OA), as well as practical elements to be considered during a transition to and implementation of such a system. Mapping the typology of equity issues across different spectrums (disciplinary, economic, regional/cultural, transition requirements, for example), we will then develop a “quality indicators” test to examine existing and proposed models (see Possible Projects). The team will survey, analyze, and discuss the many extant open access sustainability initiatives, identify positive elements, as well as gaps and problems. The aim will be to offer methods of assessing large-scale long-term initiatives (i.e., 5–20 year plans) to shift the publishing model to remove barriers to either participation or benefits based on global geography, economy, field, or culture. In particular, the team will identify inequalities and imbalances in the economics of open-access publishing and its downstream effects between the global north and south, east and west. Typology: Globally inclusive design—vetting, testing, creating by different disciplines, cultures/traditions, economics; Economics—who pays for what, who gains what; Access—to inputs (authors), outputs (readers); Discovery—metadata, aggregation, technical issues facilitating or hindering institutions’ or individuals’ access; Transition—considering viable methods for payers and players (e.g., academic libraries, scholarly societies, publishers, public) transitioning from closed-access to open; Sustainability—global sustainability of publishing models given mixed markets and local/global economies. Challenges. Developing a multi-disciplinary, global framework for scholarly communication, in its economic, social, legal, technological and cultural facets, presents numerous challenges, including finding agreement and supporting cooperation across key groups, and designing a transition path for all actors and stages in the process (e.g., collection development and acquisitions, commitments from high-level campus administrators, publisher expectations, etc.). To understand and address these issues, we will bring together participant scholars representing diverse origins, situations, expertise, and stakeholder communities. The project team itself includes voices from the humanities, natural sciences, and libraries, among others. Prior to the October SCI meeting, we will gather information and resources to study current proposals attempting to address these challenges so that these resources can be easily surveyed by the team. Team. Our initiative has three stages: (1) pre-Institute email exchanges and reading among a larger research group, (2) the Institute itself, which will be attended by a subset of the larger research group, and will result in a set of recommendations and a typology and framework for scholarly communication initiatives and (3) post-Institute activities, presentation and publication of the recommendations, pursuit of funding for further research, and coordination with other scholarly communication efforts including the co-hosting at KU, with partner organizations including K|N, a symposium at the University of Kansas in November 2016 (described below). Our hope is that the pre-Institute reading and study, the Institute intensive time together, and the planning and holding of the symposium will contribute to the co-development of a roadmap for transitioning to OA publishing that is free for reader and free for authors to participate. The main product of the work completed by the Institute participants of this proposal will be a set of pragmatic, scholar-driven recommendations or requirements mapping out steps to address and ameliorate inequality in the economics of open-access publishing on a global scale. This work will be shared openly and we will seek to publish and present this work in a prominent publication, such as The Chronicle of Higher Education. We envision the work also strengthening current and emerging initiatives by providing feedback, perspective, and guidance to those projects in order to better inform their efforts and ensure equitable frameworks along a variety of vectors. The team’s work at the Institute will inform our November 2016 symposium Envisioning a World Beyond APCs/BPCs, co-funded and hosted by the University of Kansas and K|N Consultants. The moderated roundtable symposium will be broadcast live. This larger series of meetings in November will allow in-depth analysis, provocative exchanges, and frank discussions about current plans, visions, aspirations, and challenges, bringing our post-Institute experience to the meetings. International experts in a variety of disciplines and from diverse stakeholder groups will focus on assessing, evaluating and describing the landscape of scholarly publishing relating to the design principles mentioned earlier, with a particular emphasis on the humanities. Look for more details on the November meeting and the outcomes of our Institute participation here. Among the goals of the larger project is to create a research framework and infrastructure for the scholarly communication community to pursue grants to fund and coordinate with multiple, aligned, open-access research projects, develop research capacity, and create opportunities, networks, and connections for the broadest inclusion. We envision the University of Kansas as a leading nexus for research and discussion on these topics within academia. This might involve the establishment, or recommendation of the establishment, of an international ‘congress’ or advisory or oversight group with representatives from the projects and models underway, to ensure efficient and coordinated efforts to work toward the same goal: public access to the scholarly publishing system, whether by reader or author, and other parts of the scholarly ecosystem. The work undertaken here will facilitate success in subsequent efforts to design initiatives and secure funding by identifying emerging research questions and opportunities related to scholarly communication, strengthening interdisciplinary and geographical connections among researchers engaged in scholarly communication initiatives, and assembling focused proposals for extramural funding. Who is on your Institute team? Our Institute team members are scientists, social scientists, and librarians committed to achieving equity in scholarly communication, and have extensive international experience in issues of scholarly communication, open access, digital publishing, and global engagement. Three are international scholars: Kamal Bawa is a long-time innovator in open scholarship in India, Rosario Rogel-Salazar is a sociologist in Mexico, and Tetiana Yaroshenko advances digital scholarly communication in Ukraine and the post-Soviet space. US economist David Shulenburger is a pioneer in open scholarly communication. This SCI proposal is part of an ongoing effort by a team of KU librarians and scholars concerned with inequities in the scholarly communication system from a global perspective, and developing a framework for future research initiatives. The impetus for the current project comes from this team’s 2014 paper (Bonaccorso et al. 2014) and the 2015 KU Digital Humanities Forum “Peripheries, barriers, hierarchies: rethinking access, inclusivity, and infrastructure in global DH practice”. Dr. Kamaljit Singh Bawa, FRS, is an evolutionary ecologist, conservation biologist, and a distinguished professor of Biology at the University of Massachusetts, Boston. Dr. Rosario Rogel-Salazar is a professor of political and social sciences at the Universidad Autónoma del Estado de México, specializing in social systems theory. She is a member of the Sistema Nacional de Investigadores (Conacyt, Mexico) and has collaborated in the development of current methods of evaluation of academic publications, such as the current law for open access in Mexico, approved by the Mexican federal government in May of 2014. Dr. Town Peterson (University Distinguished Professor, University of Kansas, USA). Peterson is faculty in the Ecology and Evolutionary Biology department at the University of Kansas since 1993, and University Distinguished Professor since 2007. Dr. Dave Shulenburger (Senior Fellow, Association of Public and Land-Grant Universities, former Provost of University of Kansas, economist): Senior Fellow, Association of Public and Land-grant Universities. Dr. Tetiana Yaroshenko (PhD in LIS, Vernadsky National Library of Ukraine) is Vice President for Research and Information Science at the National University of Kyiv Mohyla Academy (Ukraine) and Assoc. Prof. of Librarianship at the Kyiv National University of Culture & Art. Ada Emmett, Librarian at the University of Kansas (KU) since 2002, is the director of the David Shulenburger Office of Scholarly Communication & Copyright and Librarian at the University of Kansas Libraries. This is the third in a series of posts about each of the teams that will be attending SCI 2016, and their projects. This one was submitted by Meredith Goldsmith. What are the goals of your working group and how do they fit the theme of this year’s Institute? If our team has a theme, it would be “Size matters.” Our team proposes to explore existing models of open access transitions to consider how they might be scaled to meet the needs of small societies in humanities disciplines. We recognize that smaller scholarly organizations, especially in the humanities, face particular practical and theoretical challenges around the transition to open-access publishing. The challenges are rooted in the culture of small organizations and their publications. First, small humanities societies are often fully dependent on membership fees to publish their journals. Editors and society staff support their journals as a labor of love, struggling to produce a quality product in the face of rising costs and little or no institutional support. Our group includes two editors of small society journals, one of whom is a former society president. 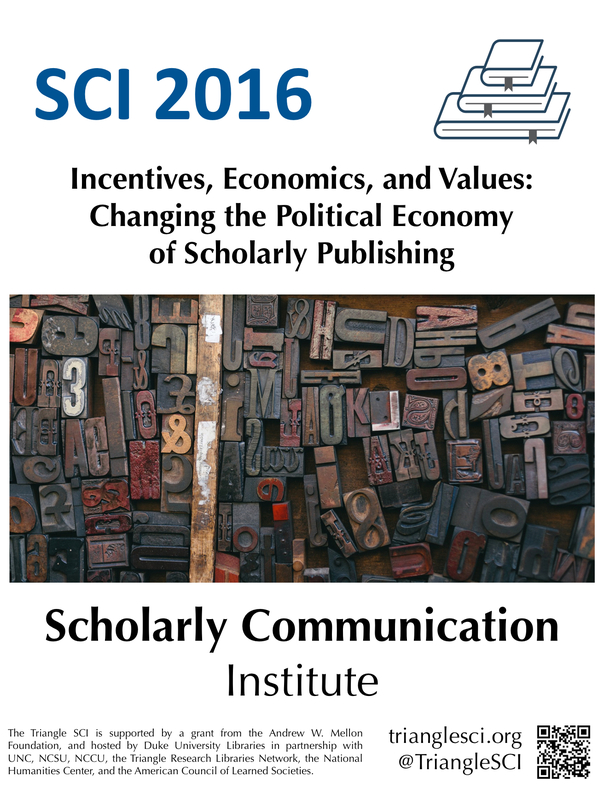 Although small scholarly societies recognize the cost of adhering to an increasingly expensive print‐only business model, they are often resistant to assume the risk of changing their production model, leaving such organizations and their publications “frozen in place,” as Rebecca Kennison and Kristen Ratan have argued. Finally, the incentives of the promotion and tenure system, especially in small institutions where the open access movement is just beginning to gain traction, have kept scholars in small humanities societies stuck in different ways. Despite or because of the rapid proliferation of new media and new publications, humanist scholars must debate where and how to disseminate their work in new ways. Small organizations rooted in print publication will need to draw upon a range of different examples and to reconcile competing imperatives. By bringing stakeholders together from a broad range of perspectives — scholarly editors, publishers, and digital scholarship professionals — our working group aims to develop a more nuanced perspective on OA transitions than has been advanced in recent scholarship. Editors of small journals and their boards must take into account cost and prestige and scholarly values and product quality and peer review, among other considerations. When faced with what seem like untenable choices, it is no wonder that those working for small scholarly organizations have felt as if our options are, to put it generously, limited. It is our hope that this working group, drawing upon published scholarship, existing models, and our own creative explorations, can develop a model that draws upon our multiple perspectives, even if it does not entirely reconcile them. And we are particularly optimistic about the opportunity to bring the expertise we bring from different sides of the field—that of teachers, scholars, publishers, and editors, and professionals working to bridge print and digital media. We are particularly excited about the opportunity to bring together editors, publishers, open access platform developers, and digital scholarship specialists. We believe that Triangle SCI will offers an unparalleled opportunity to unite around our common goals–the dissemination and advancement of new scholarly knowledge. If small scholarly societies—and their journals—are going to survive, we will need not only to develop creative solutions, but to listen carefully to all those with stakes in the political economies of academic publishing. Meredith Goldsmith is a professor of English at Ursinus College, the editor of the Edith Wharton Review, and the past President of the Edith Wharton Society. She is also the founder of the Library of the Future Group at Ursinus. Patrick Alexander is the director of Pennsylvania State University Press, which publishes approximately 50 books in the arts and humanities annually, as well as 41 scholarly journals. Since his arrival at the Press in 2007, its publication of scholarly journals has quadrupled. Kristen Ratan is the co-founder of the non-profit Collaborative Knowledge Foundation (CKF), whose mission is to build open-source solutions for scholarly knowledge production that foster collaboration, integrity, and speed. Before co-founding the CKF, Kristen was most recently the publisher at the Public Library of Science (PLOS), where she leveraged new technologies, policies, and best practices to transform scholarly communication. Eric Bain-Selbo is the editor of Sunshine law, a Penn State UP journal, and the executive director of the Society for Values in Higher Education. is the Department Head of Philosophy and Religion at Western Kentucky University and Co-Founder of the WKU Institute for Citizenship and Social Responsibility. Cheryl Ball is associate professor of digital publishing studies at West Virginia University and the editor of the on-line journal Kairos: Rhetoric, Technology, and Pedagogy. She recently received a million-dollar Mellon grant to develop Vega, a new platform for on-line, open access publishing (http://vegapublish.com/). John McLeod is Director of the Office of Scholarly Publishing Services (OSPS) at the University of North Carolina Press which provides the UNC system with access to a range of sustainable, mission-driven publishing models and solutions. McLeod has twenty years of publishing experience in areas such as sales and marketing, digital publishing, and intellectual property and copyright. What do you look forward to most from SCI, and what do you hope to accomplish through the Institute? What are your plans for next steps after the Institute this fall? We are particularly excited about the opportunity to get out of our silos—print v digital, academics v publishing professionals, and so on–and to draw upon and further cultivate our interdependencies. We are eager to explore non-traditional means of disseminating our findings, especially as we seek to reach a range of audiences: faculty and administrators, scholars in small societies, and publishers. We are considering creating a webinar in which deans share their perspective on open-access publishing; and a white paper for the Oberlin Group and/or Lever Press, among others.